Hard to say if bears have had enough or are just waiting for worse news to follow, but the Greek referendum didn't have too much of an impact on Monday's action after the long weekend. In the case of the S&P, early losses didn't go as far as to tag the 200-day MA, but the 200-day MA has played as support. 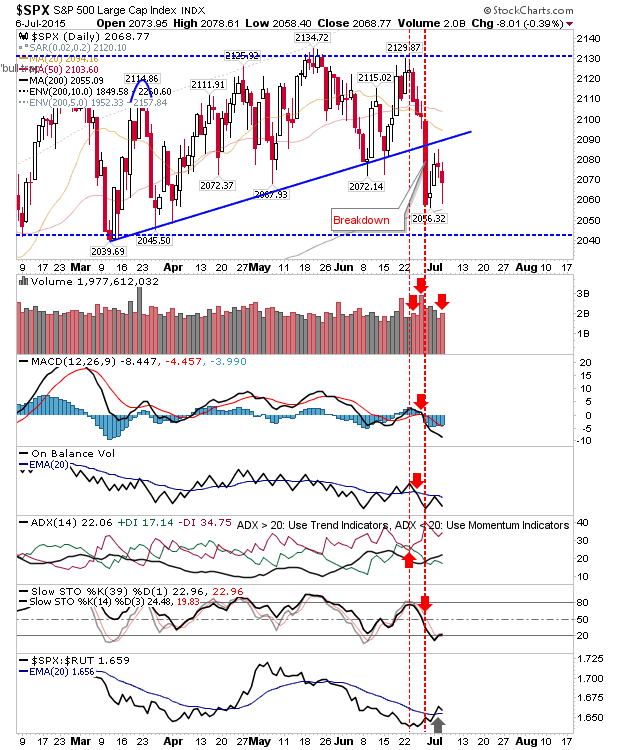 Technicals remain next bearish, and the swing low at 2,039 is calling. Volume climbed to register net bearishness, although there is a relative loss in performance against the Russell 2000. 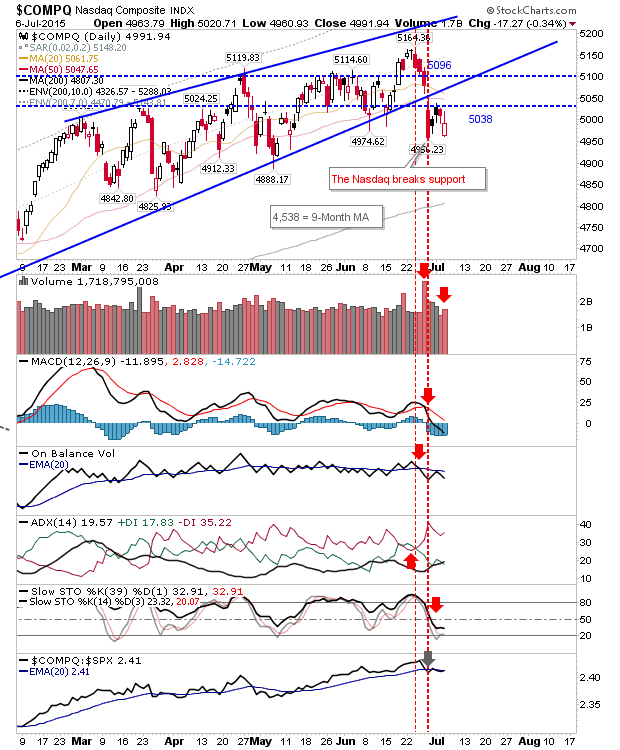 The Nasdaq continues to consolidate below 5,038. 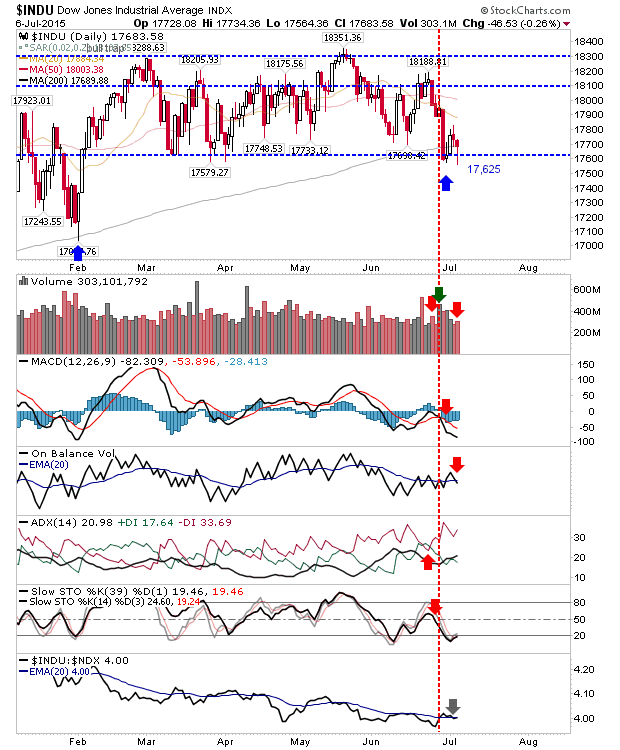 Higher volume distribution plays the bearish tune, and technicals are net bearish. The 200-day MA remains a tasty proposition to the downside. The Russell 2000 opened at new lows and closed near Friday's close in a decent recovery. The June 'bull trap' is still the dominant pattern and unless it breaks above 1,279 and starts pressuring this supply then bears still hold primary control. The Dow is pushing the 200-day MA more so than the S&P. It started below this moving average, but managed to do enough to regain it by the close. The index managed a successful test of this moving average at February, and is working again on one for June. 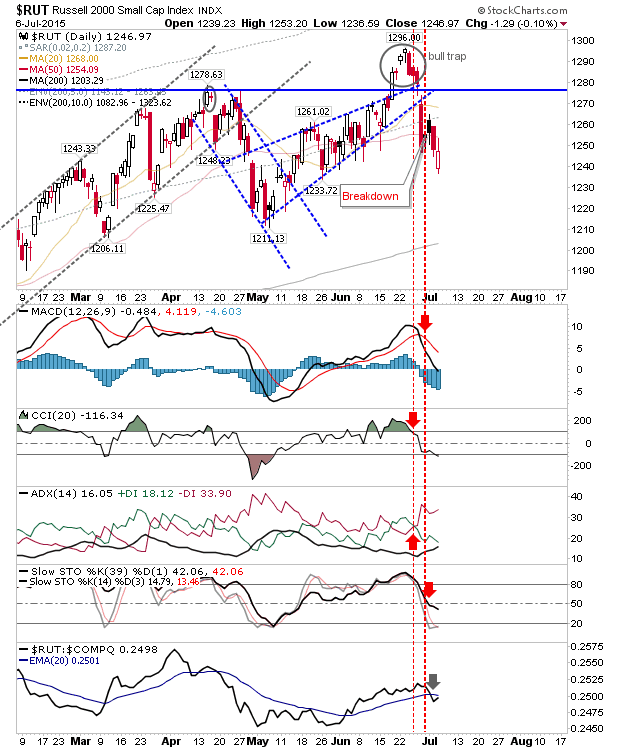 The Semiconductor Index pushed a break of the 200-day MA after dropping out of its upward channel. 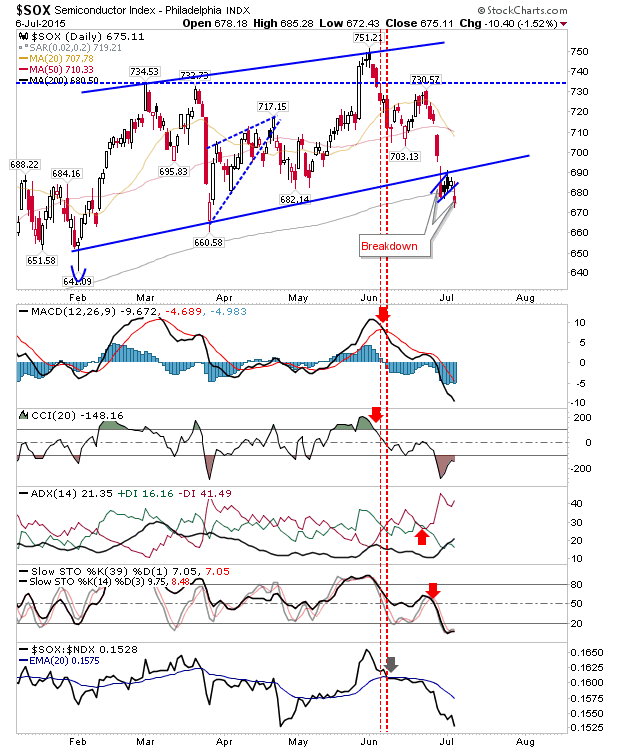 Last week's action at the 200-day MA formed a 'bear flag', with today a follow through breakdown (of the breakdown). The loss of the 200-day MA adds to the bearish tone (as do the net bearish technicals). Nasdaq Breadth continues to map bearish divergences, although there is no reason resistance can't break higher, adding fuel to the existing rally. On the flip side, Nasdaq breadth remains well off oversold conditions; conditions last visited in 2011. 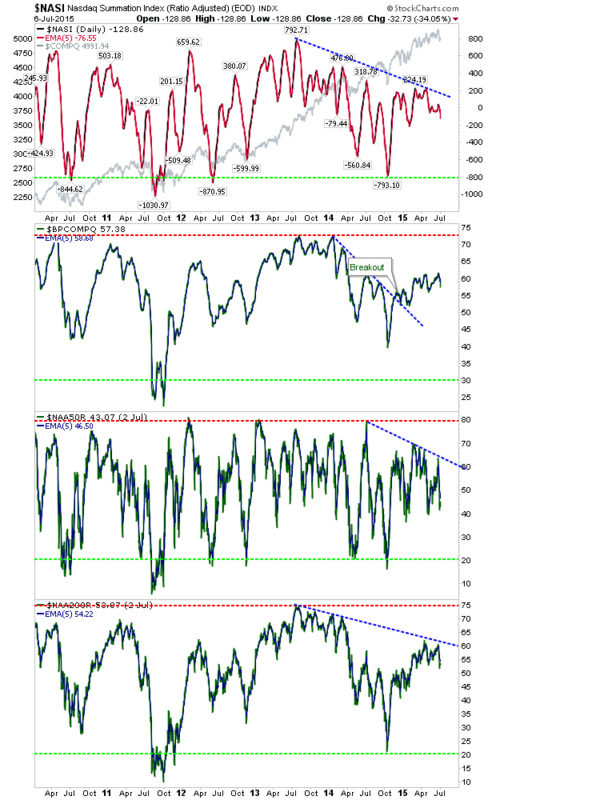 Markets came close to complete oversold conditions in 2014, but rallied before things truly capitulated. Results in the Greek Referendum is not the end of the story, and each snippet of news will play its own role. The next big shock is set for July 20th, but smaller shocks are likely on the way. I would be more comfortable with another 2011 (or 2009) washout, but it's not coming easy.